With the development of the online procedure to apply for an FD, the process of opening a Fixed Deposit has become much simpler. Instead of standing in never-ending queues and documentation, you can now open a fixed deposit account within a few days and a few clicks. Moreover, you can now compute the FD interest rates and the returns using the online FD interest calculator. You might need to provide a few details such as the customer type, amount to be deposited, tenor, type of FD, and the frequency of the interest payouts to know the accurate returns. If you opt for a non-cumulative FD, the interest earned is paid to you on a monthly/ quarterly/ half-yearly/ yearly basis as per your preference. 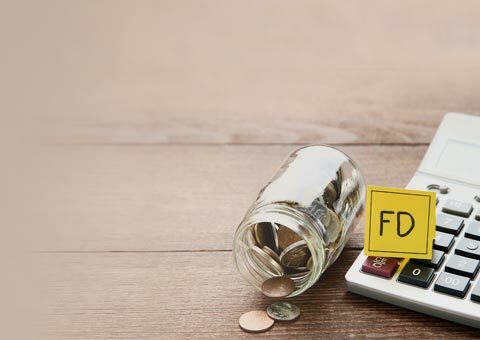 On the other hand, if you opt for a cumulative FD, the fixed deposit interest rates are calculated on a quarterly or yearly basis and added to the invested amount and returned to you after the maturity period. Financial experts suggest investing in cumulative FD for earning high returns as compared to non-cumulative FD. How to Use an Online FD Calculator? Although there are manual methods to calculate the FD interest rates, with an Online FD interest calculator, the calculation part is carried out online when all you do is provide a few basic details. One of the prominent financial companies in India, Bajaj Finance is known for its quick application and processing. Along with many lucrative investment options, the company offers attractive FD interest rates up to 9.10% which is the highest amongst other secure investment options. Since Bajaj Finance offers a special tenor FD for 15 months, you need to choose whether you want to opt for a 15-month FD or you want to calculate the returns for a regular FD with tenor from 12 months to 60 months. Next, you need to select the type of customer from the customer category of new customer, existing customer, and senior citizens. This step is essential as the company offers high interest rates to its senior citizen customers as well as existing customers. The 3rd step is to choose the type of FD from cumulative and non-cumulative FD. Based on your choice of the type of FD, you may get the flexibility to select the frequency of the interest payout. If you have chosen a non-cumulative FD, you will have the flexibility to choose the frequency of interest payout while if you opt for cumulative FD, the interest payout will be along with the maturity amount or on an annual basis. If you do not wish to collect the interest rates after one year, you can reinvest them along with the maturity amount to for higher gains. You need to choose the amount you wish to deposit in your FD account; the minimum of which is Rs. 25000. As per your provided information, the interest rate will be displayed on the online calculator. Next, if you have not opted for special tenor FD of 15 months, you need to choose the tenor of your FD as per your convenience from 12 months to 60 months. After the completion of these steps, the interest rates on Fixed Deposit, as well as the maturity amount you will earn from your investment, shall be displayed on the screen. Based on the results, you can manage your finances and invest your money as per your financial health and your financial goals. With FAAA and MAAA highest credit rating from CRISIL and ICRA, the company reflects credibility and the security of the invested money. In case of any queries regarding your investment in FD, the company has offered its 24/7 contact number as well as email ID for assistance and support.